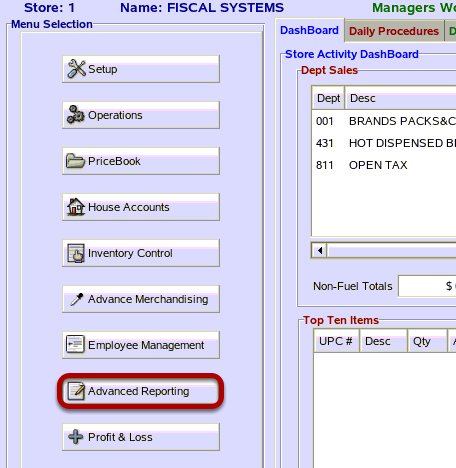 TravStar1 Point Of Sale SystemManager's Work Station ReportsHow Do I Run the E-Journal Report? How Do I Run the E-Journal Report? This lesson will teach you how to run the E-Journal Report. This report is used to view all transactions ran at a register(s). From the main menu, click on the "Advanced Reporting" button. 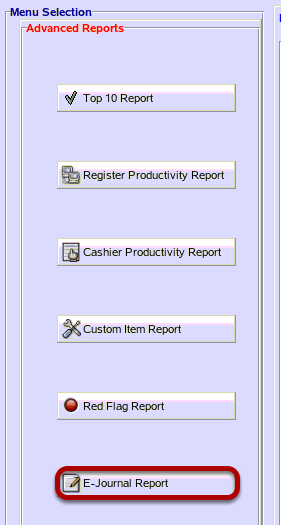 From the Advanced Reports menu, click on the "E-Journal Report" button. (1) Click the arrows beside the Reporting Sequence drop down menu. Then, click on the type of Reporting Sequence you want to sort the data from. (2) Type the register(s) you want to run the report for. This can be a single register, a range of registers, or all registers. All registers can be ran by typing in the number 0. 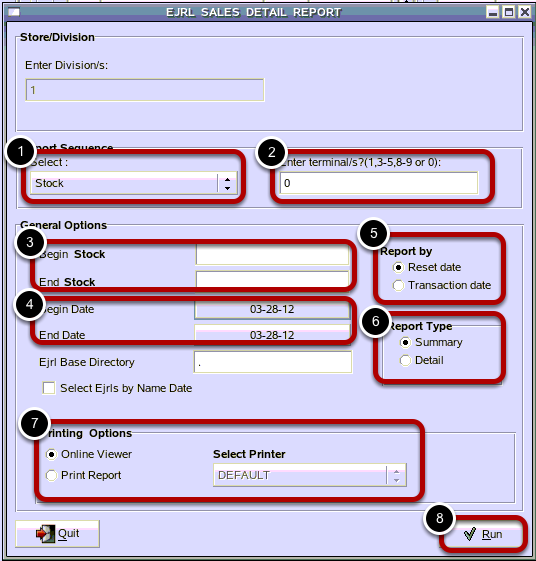 (3) Type in a Begin Stock number and an End Stock number. This is the range of data you want to run the report for. Note: This filed title will change depending on the Reporting Sequence selected. (4) Click inside the Begin Date and a End Date fields. Click on the dates you want to begin and end the report range. These fields will default to today's date. (5) The Report By field will default to Reset Date. If you want to run this report by Transaction Date, click inside the bubble for Transaction Date. (6) The Report Type field will default to Summary. To run the report in detail, click the bubble beside Detail. (7) To print the report, click the bubble beside Print Report. To view the report online, click the bubble beside Online Viewer. You can still print the report if you view it online. The recommended printing method is to always view the report online first before printing. (8) Click on the "Run" button. This is an example of the E-Journal Report. Note: This report will be blank if there are no sales for the options selected. Prev: How Do I Run the Red Flag Report? Next: What Are Cashier Permissions?